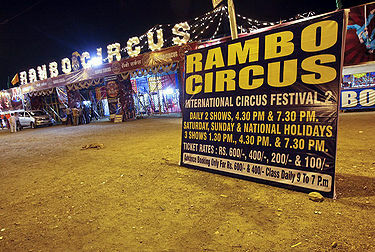 But this was only the first of several circuses emanating from the Chirakkara’s circus school, and soon, Kerala would be known as the Cradle of the Indian Circus. Over the years, Chirakkara's school gave birth to such companies as the Whiteway Circus (created in 1922 by Kunhikannan’s nephew, K. N. Kunhikannan), the Great Rayman Circus (created in 1924 by another disciple of Kunhikannan, Kallan Gopalan), the Great Lion Circus (also founded by K. N. Kunhikannan), the Fairy Circus, the Eastern Circus, the Oriental Circus, the Gemini Circus, and the Great Bombay Circus. The Chirakkara’s circus school didn’t train only future circus entrepreneurs: Many of Kunhikannan's pupils became circus stars in India, and sometimes internationally. The most famous of them is perhaps Kannan Bombayo, the legendary ropedancer, who graduated from Kunhikannan’s school in 1910, was a star performer in the United States in the 1930s, and was subsequently featured in several major European circuses.